Photo: J. Clinton Brogdon House, ca. 1911, 3755 Boots Branch Road, Sumter, SC. Listed on the National Register of Historic Places in 1993. Photographed by User:Charlesinsumter (own work), 2014, [cc-by-3.0 (creativecommons.org/licenses/by/3.0)], via Wikimedia Commons, accessed June, 2015. Sumter County administrative offices are located at 13 East Canal Street, Sumter, SC 29150; phone: 803-436-2102. Sumter County has a rich historical and cultural heritage that is linked to major events in South Carolina and the United States history. In addition to its Revolutionary War link to General Thomas Sumter, Sumter County has the unique distinction of being the location of the last significant fighting in the Civil War in South Carolina. Sumter County has both historical and architectural qualities which are unique, and a cultural legacy that should be preserved and protected for future generations. What is today known as the City of Sumter is one of South Carolina's older midlands backcountry settlements that came into being during the late 18th Century. Sumter grew in size and importance as a commercial center in the early 19th Century, serving as a trade and transport center for the surrounding farms and plantations. It also played an important role in the development of the railroad system in South Carolina. The Wilmington & Manchester Railroad passed directly through the town, linking the area with Columbia to the west and the port of Wilmington, North Carolina to the northeast. As the town prospered and developed, many fine residential structures and commercial buildings were erected that still stand today. These structures provide a concrete link to Sumter's past. 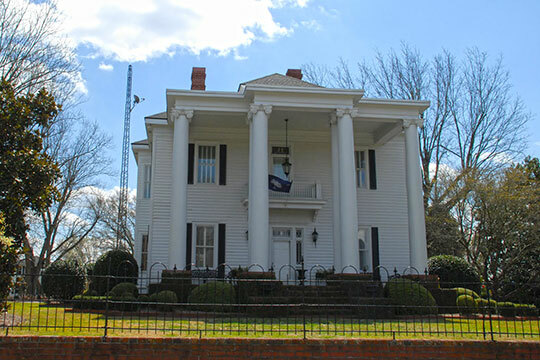 While the City of Sumter is the County Seat, other municipalities and areas including Stateburg, Mayesville, and Pinewood are home to several locally significant historic properties and structures. Due to Sumter County's rich architectural heritage, our community is home to three National Register of Historic Places Historic Districts and several individual properties listed on the National Register. County of Sumter, South Carolina, Sumter 2030 Comprehensive Plan, 2009, www.sumtercountysc.org, accessed June, 2015.